The discs in your spine help to cushion the impact from your vertebrae. They also enable the spine to move more freely, and without them, our range of movement would be far more limited. It’s natural for the cervical discs to become worn over time, and 60% of those over the age of 40 have the condition to some degree. However, for others, the problem can be severe. 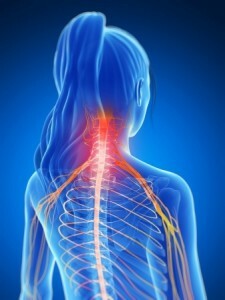 If you’re experiencing moderate to bad neck pain and stiffness in the area, you may need to see a neurospinal surgeon. In order to ascertain the nature of the condition, your surgeon will conduct a neurological exam, assessing your reflexes, your strength and the level of sensation in your arms and hands. You may also be recommended an X-ray, MRI scan or CT scan, in order for the surgeon to get a clearer image of the spine and make a diagnosis. Can the Problem be Cured? For some people, the problem may be treatable without medical intervention; and some may prefer to manage their discomfort with over-the-counter medication, such as Tylenol or Ibuprofen. If the pain is really having a detrimental impact on your life, your surgeon may recommend a course of physical therapy, to help reduce pain and stiffness. This might involve cervical traction, or manipulation of the surrounding muscles and joints to improve strength. For other, more severe cases, surgery is likely to be the best course of action. Whether you decide to have surgery very much depends on how bad the pain is, and whether or not you feel you could live with it or not. The most common form of surgery for cervical neck disease is a discectomy. The surgery involves the removal of the degenerative disc, and it’s likely that a prosthetic disc will be used as a replacement. The Important thing to realize is that help is available; and it’s highly likely that a neurospinal surgeon will be able to offer some form of treatment to help ease or cure your symptoms. If you suspect that you may have cervical neck disease and want to discuss your options, simply get in touch with Neurospinal Associates by calling (941) 794-3118.